Businesses should look to IT to be an engine for innovation and strategic advantage. Unfortunately, IT often fails to fulfill this role as the department can be mired in “Keeping the Lights On” types of projects. New technologies, however, are realigning IT with business needs and amplifying its affect on the company. On the one hand, the cost of delivering basic IT services like email is declining as systems improve and become more automated. A recent example is the influence had by cloud services like O365, which delivers email (among other services) with little to no maintenance cost. On the other hand, IT systems can play a big role in making a company more competitive. IT budgets are and should be increased each year as businesses look to invest for better agility and strategic advantage. A good recent example is the rise of business intelligence and big data and the change realized by those technologies. This trend of lowering investments in commodity IT and increasing investments in innovation should reorient IT efforts to better align with business objectives. 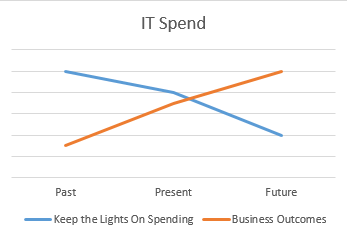 Even if the IT budget itself may not grow year to year, companies indirectly invest in IT through the rise of Shadow IT, or the common practice of people outside of the IT department making purchases that would have traditionally fallen to IT. Some estimate that over 40% of IT decisions are now made outside of the IT department. A few IT Directors have chosen, unfortunately, to abdicate their responsibilities with the sentiment, “If it’s not my server, then it’s not my problem.” Also common is the power grab approach outlawing line of business level purchase of systems without IT approval. A better approach is to take the lead in the innovation challenge. IT should push users to (safely) consume SaaS software and facilitate the assimilation of such products into the business’s application portfolio. Microsoft has tried to reinsert IT into these decisions by solving the identity problem. Through Microsoft products, IT can offer single-sign-on to a myriad of SaaS services and thereby reassert control. Some IT departments have set up corporate pricing for Azure and other systems, or have published APIs to better control the matrix of systems. IT needs to offload as much commodity IT as possible to make time for helping the business solve problems. IT no longer, if ever, should be about caring for servers and networks. IT should be about business outcomes and innovation. IT departments need to offload Keep the Lights On work and move on to the projects that will lead the business forward.